We need a Jedi Temple in the Outback. AF claims that this makes Australia seem more religious than it is (it's recorded as a 'Not Defined' religion) and could ultimately affect public policy and funding if allowed to continue. Perhaps they're also expecting a spike this year with last year's Star Wars movie success, the aptly titled The Force Awakens? 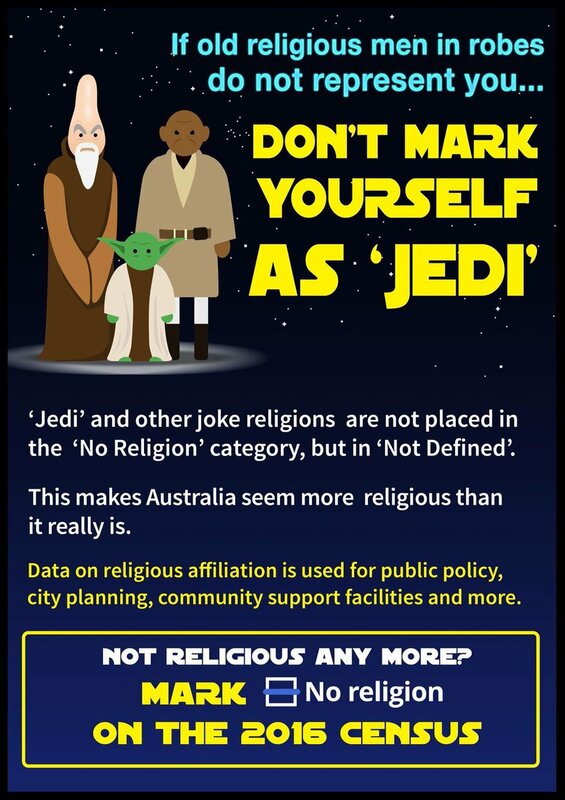 Now I'm not an Atheist and I'm also not religious so I'll be marking 'no religion' on my census form however, if you prefer to identify as a 'Jedi', even for no other reason than it amuses you to do so, then I say go right ahead. 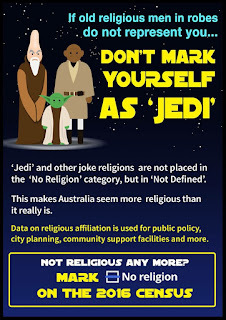 Clearly the ABS does keep track of actual numbers of people who mark down Jedi, and clearly people are aware that the 'Not Defined' religious category is filled with a number of joke religions (you've heard of the Church of the Flying Spaghetti Monster, right? That's a real thing). Plus, if you are going to identify with a religion then Jediism isn't a bad way to go. The Jedi are supposedly peacemakers. As soon as you say you're a Jedi in real life, most people find it kind of amusing and know they're not about to get an ear full of how great it is to be a born again Christian or spruiked the merits of reading a Watch Tower magazine. Rather than decreasing Jedi numbers, how about working hard to increase numbers so the ABS has to concede and list Jediism as a separate category. 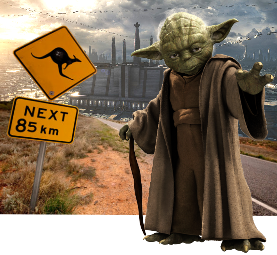 If the numbers get high enough you may even have a legitimate case to apply for funding of Australia's first Jedi Temple. The Star Wars movie franchise isn't going away any time soon since Disney bought the rights. If you want to follow something religiously, there's plenty of related documentation to suggest that being a Jedi is at least as legitimate as being a Scientologist and a whole lot more fun too. Stuff the Atheist's Foundation and their agenda. They don't know they're right either. If you want to be a Jedi, go right ahead. I haven't heard of the Jedi joke, but my religion with my family was just Church of England. I and my elder sister, Carol used to go to church most Sunday mornings as children if we got up in time, but we always went to the Sunday school in the afternoons. This was to the local church (Church Of St. John) and to the Sunday school rooms just across from the church in the road that ran up the side. There were two rooms there, one with a stage where concerts were held, and the local youth club on a Sunday evening which I used to go to later as a young teen. You had to have gone to the evening service first, or the vicar wanted to know why when he came into the club room. The Sunday school was divided up into classes in groups with usually a lady teacher for each, and we'd have a religious story and then do a drawing about it. The whole room would sing a hymn before and after the classes and a prayer. I used to enjoy it, and our parents would have a break for about an hour or so. It began at about 2pm to about 3pm. We were in walking distance of about 10mns. Your Dad's family were Unitarians, which I'm not sure what it was, but he said they didn't believe in Hell fire and damnation and the Holy Ghost etc. They used to go to the local Pudsey church at the top of the street at 6pm each Sunday, but your Dad and your Auntie Margaret didn't go, as they didn't expect them to. They used to stay wash up instead after their tea. So, if you wanted to have a religion you could call yourself Church of England. I'm quite happy not to identify with any religion thanks. I kind of think you actually have to practice a religion, or at least identify with it in some way, before you can say you are religious. I find religious people who love nothing better than to tell you about their religion and why you should consider attending their church insufferable. So do I. I don't particularly consider myself to be religious, but I just thought you'd like to know about what me and your Dad's were. People get married in church that aren't religious. I'm pleased we got married in my local Farsley church, as I didn't want to be married in the Pudsey one, with being born in Farsley and having attended church and Sunday school there as a child. It's nice to have someone to pray to. I thank God for a lot of things in life, and pray for people that are sick or to keep people safe and well, and reasonably happy. I have nothing against people who are religious (except for those that want to convert you to their religion, even after you've told them you're not interested). If it works and you find it beneficial then great. It's just not for me.